Smoked pheasant breasts are easy grilling. Just remember that the meat is lean. If you overcook, it ends up dry and chewy. Target temperature for the meat is 165°F (74°C). Mesquite smoke adds great flavor but first, seasoning. I decided to go simple. 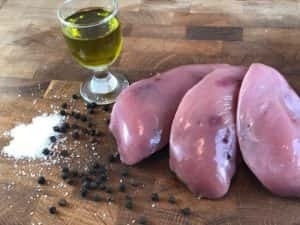 Season your pheasant breasts all over with salt and pepper. Then put them into a kitchen bowl with good splash of olive oil. Mix and put into a fridge for at least 4hrs. I used my Monolith Classic kamado grill for smoking. I loaded the grill with lump charcoal and placed the heat deflector on top of them. This allows cooking with indirect heat and it is the right way to go especially when smoking. Once grill temperature hit 225°F (108°C), I put handful of mesquite wood chips on top of hot charcoal. Then put all the pheasant breasts on the grill grate. Following meat temperature is very important. I use Thermapen thermometer as it reads very fast and is easy to use. There are other brands also, but I have been very happy with my choice. 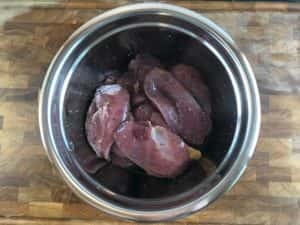 It took 50min to reach 165°F (74°C) and my pheasant breasts were ready for the dinner table. Roasted potatoes or root vegetables go well with pheasant. Here is also a great recipe for Cranberry Sauce. 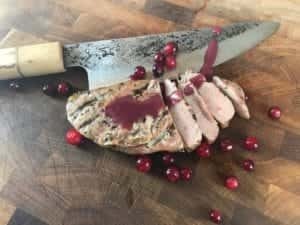 It is delicious on pheasant but also with grilled venison.